I selected two projects out of Bar’s book to bring to you today, celebration style! 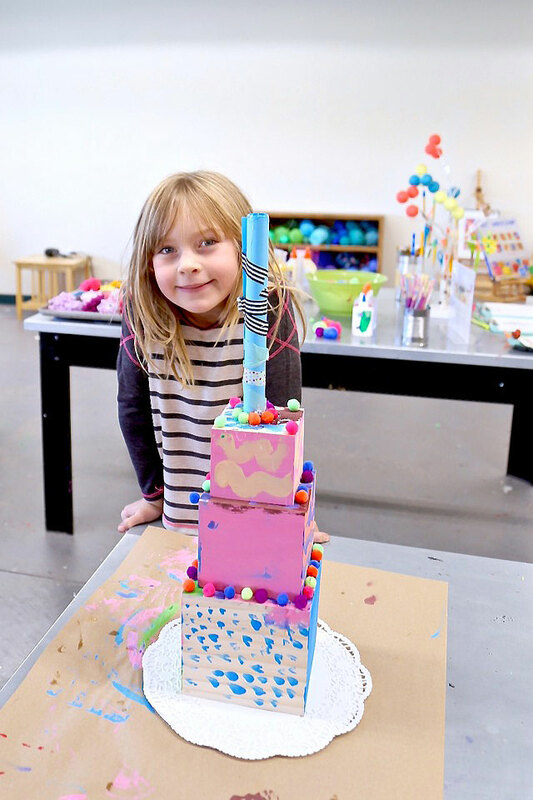 In our art studio, we created a delightful dessert party for children to celebrate Barbara Rucci’s journey, as she’s been creating this book over the last two years! I’m so proud of her! Way to live your dream, Bar! Thank you for gifting the world your beautiful book! You are such a gift to everyone you meet! So thankful to be your friend, so thankful for your book! 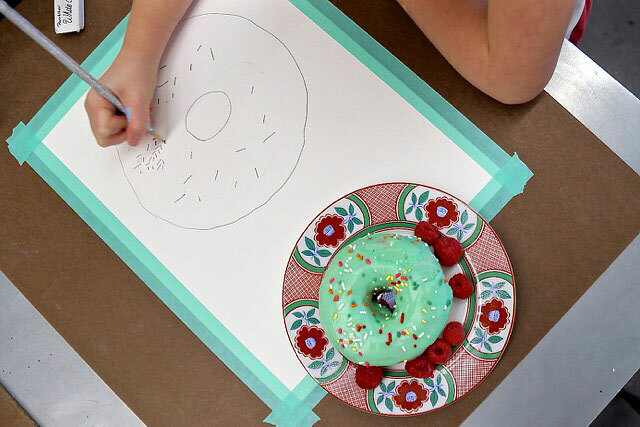 Take a peek at our Art Bar Dessert Party: Cakes + Doughnuts, inspired by two of the workshops in Art Workshop for Children! You can buy this incredible book anywhere books are sold! 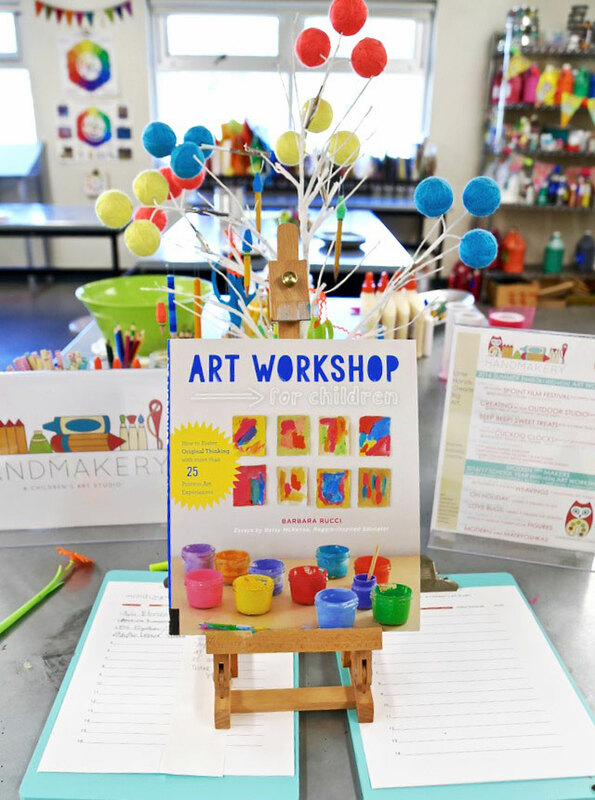 Absolutely adore how Art Workshop for Children simply guides on supplies to gather, how to prepare your space, the process, observations, and variations for next time! Take a peek! 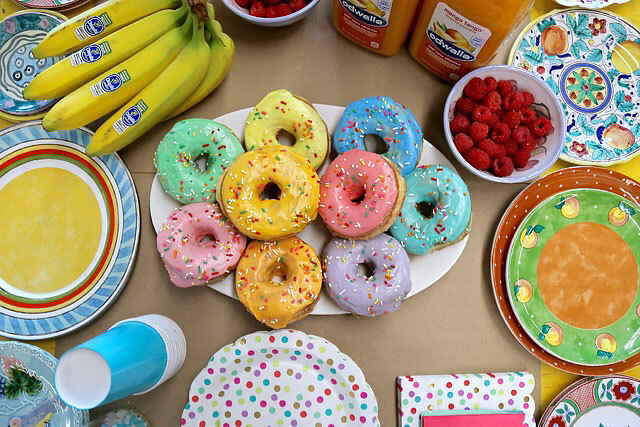 Still life object- We jumped on Bar’s suggestion, “a doughnut for its simple shape, bright colors, and yummy deliciousness” special ordered from Sweet Coloradough and placed on specialty plates from our personal collection! 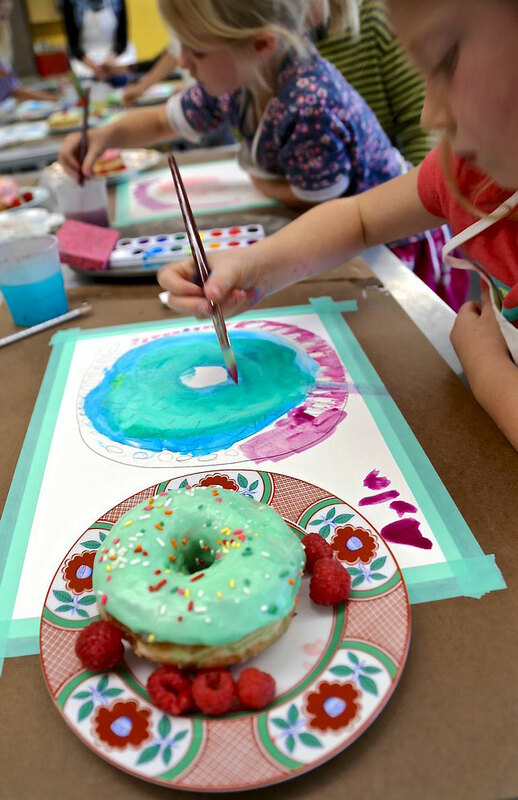 Again, absolutely adore how Art Workshop for Children simply guides on supplies to gather, how to prepare your space, the process, observations, and variations for next time! Take a peek and order your book today! You’ll LOVE everything about this incredible resource! 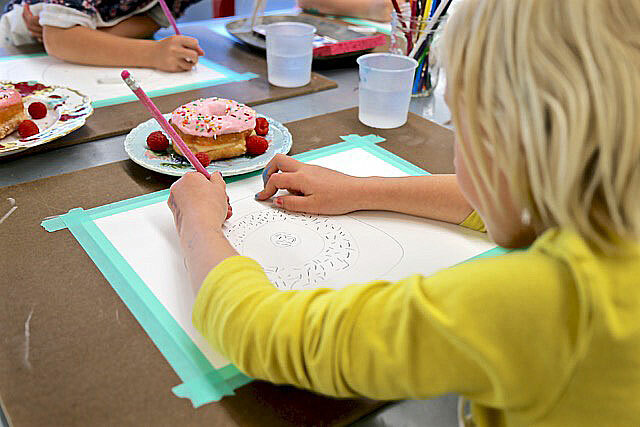 Author to Art Workshop for Children. Beyond passionate about kids and art. Shares her home in Connecticut with her husband, three children, dog, and fish. Explores her passions everyday. Her blog is a place where she cultivates her love for art experiences, sharing simple tips and ideas to bring creativity into lives. Showcases the most creative artists, curates the best crafts, and shares the most amazing creations from her studio. If you want to dig a little deeper, you can read this interview she did for Hello, Wonderful, and see her home on Design Mom. Bar’s philosophy: Create a happy place! I believe that every child is born an artist and that somehow, they lose the ability to think creatively when they reach adulthood. 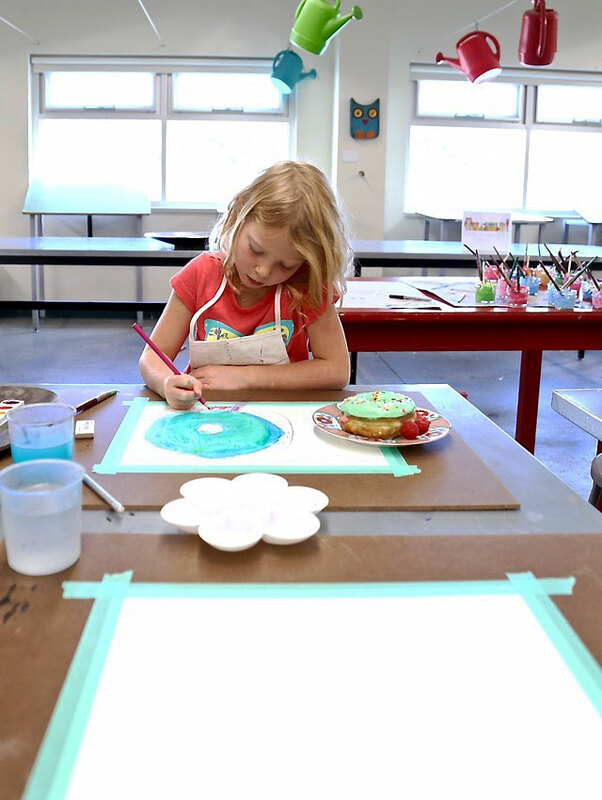 Art Bar Blog will encourage and teach moms to find their inner artist by providing their kids with simple ways to express themselves and problem solve. My wish is to create moments in childhood whereby a child can experience flow, a single-minded immersion in an activity that creates a feeling of spontaneous joy. From this kind of focus comes success, and from success comes praise from others. Praise from others (peers, teachers, coaches) in childhood is the key to adult happiness. Ahhhh…so simple! My goal for my own children is to create memories of a home filled with art, music, books, crafts, games, baking, singing, dancing, dress-up, movie night, dog hair, cartwheels, fireflies, kisses, hugs, tooth fairies and smoothies. 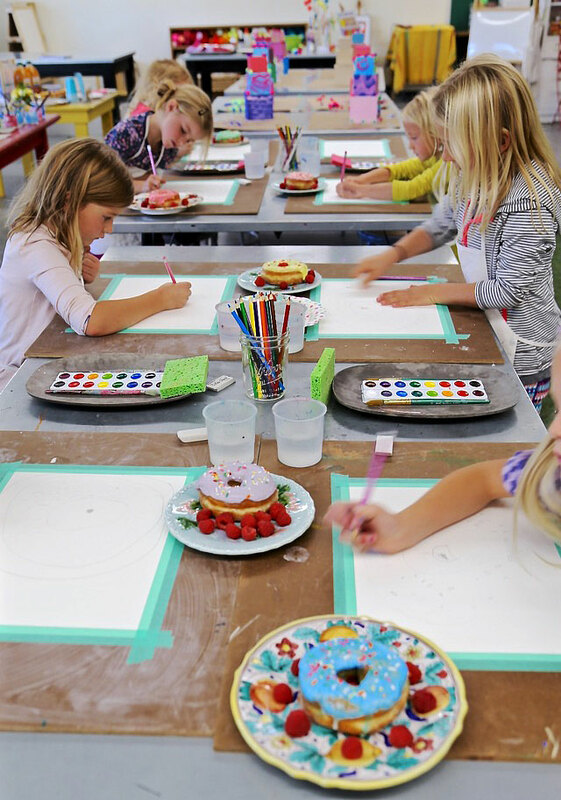 Art Workshop for Children is an essential ingredient to a creative childhood, overflowing with hands-on experiences to spark the creative soul of every child while instilling the confidence that EVERY CHILD IS AN ARTIST. Barbara’s inspiring vibrance and creative brilliance shines bright as she mixes up enriching artful experiences, while capturing the essence of authentic art making at its purest form. 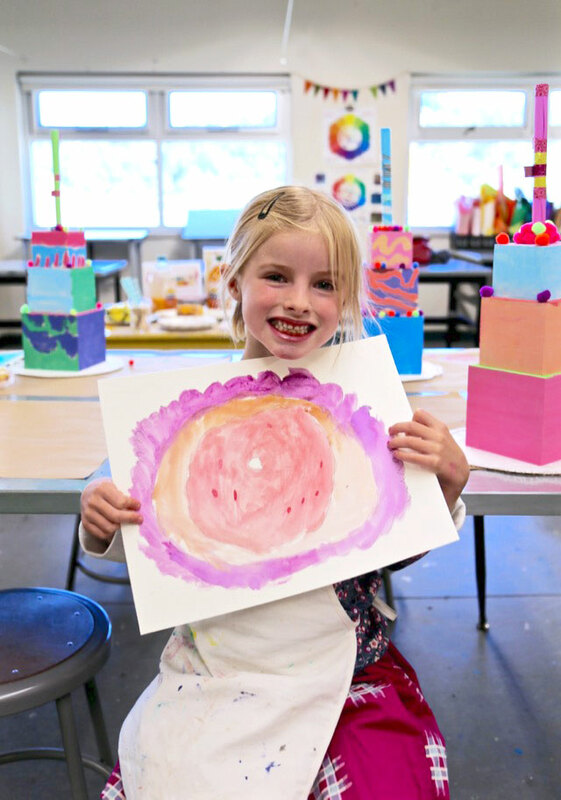 Art Workshop for Children is an essential for every creative environment as it captivates enriching, open-ended and engaging experiences for all walks of childhood. 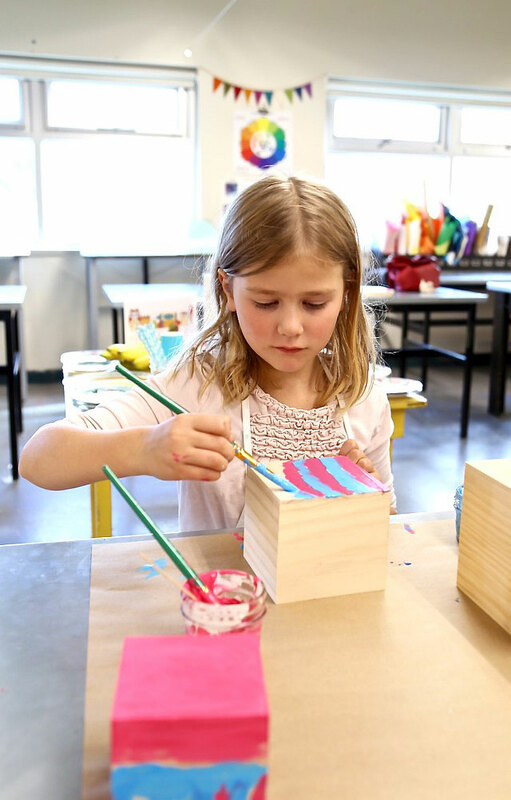 Each manageable workshop is tried and true, within a collection of genuinely genius artful settings that will strengthen and build a strong foundation for a creative mind and passion for self expression that will last a lifetime. This gem is one you’ll open again and again, overflowing with fundamental experiences that adapt and grow with every child. 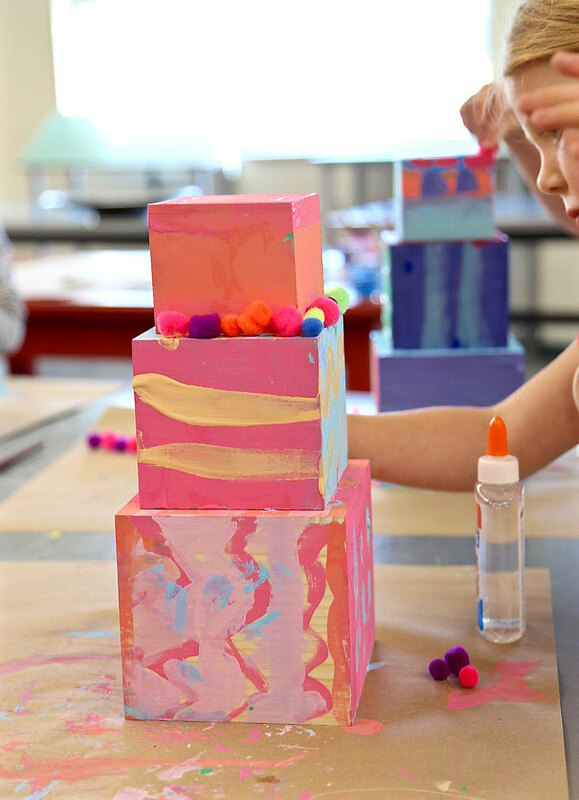 Art Workshop for Children contains a diverse approach to authentic, hands on, stimulating, valuable experiments tied to individualized outcomes that will make every child as artist feel successful, proud and original. 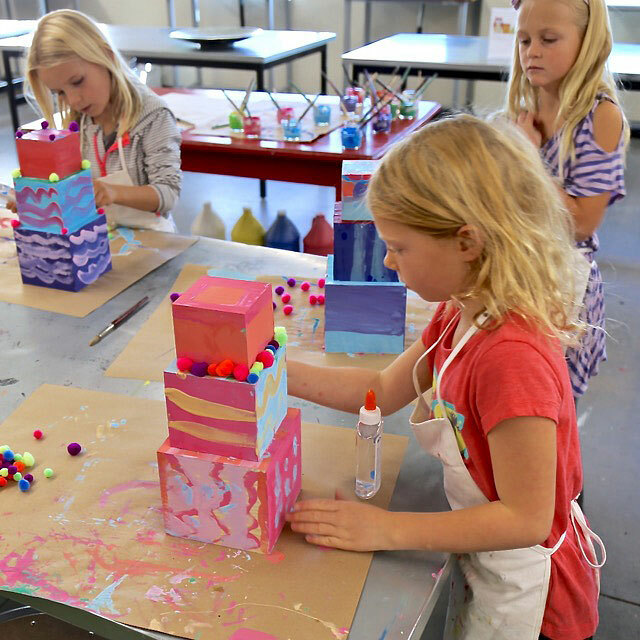 Art Workshop for Children is the seed to plant to grow a creative minded child and mini maker. Focused on a collection of simple supplies, this resource is what every caregiver desires to nurture a colorful and creative childhood, while gifting the knowledge and experience every child desires to shine with confidence. The layout is beautifully designed with structure, style and simplicity, capturing an inspiring yet manageable setup focused around a self guided framework to foster the whole-child. 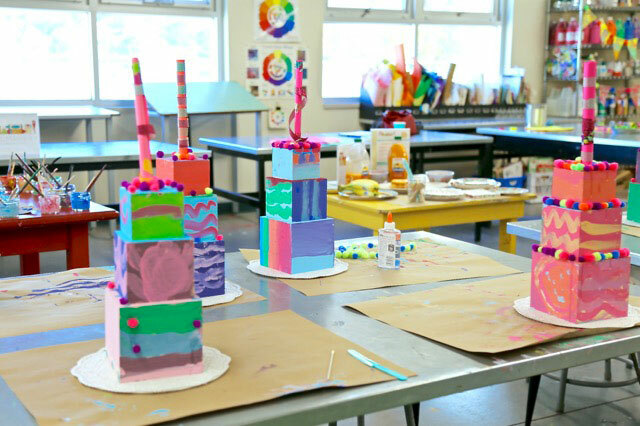 As a mama to two children and a children’s art educator for over 20 years, Art Workshop for Children will be an essential resource to my collection that I will use consitently within my maker’s space as it provides an open ended foundation with endless possibilities. 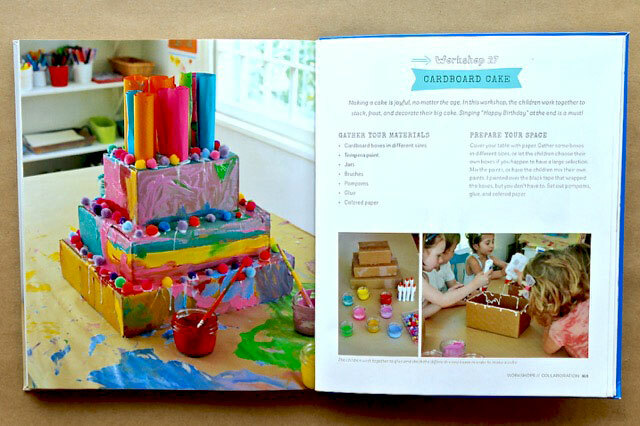 As modern makers with a passion for children and creativity, I couldn’t imagine a better book to add to a creative collection! Thank you Barbara Rucci for inspiring and captivating with complete eye candy. You are truly a passionate and miraculous maker, we’re so lucky to have you making this world a more art filled place with confident and creative minded artists! 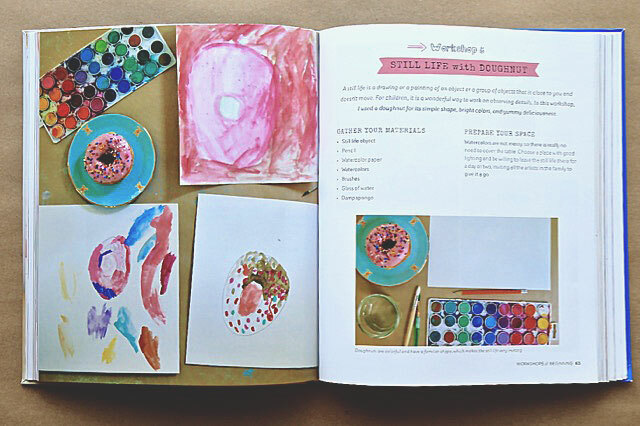 This book is truly one of the best art resources I’ve come across, can’t even wait to own it and share it! Thank you for all you do, thanks for being YOU! 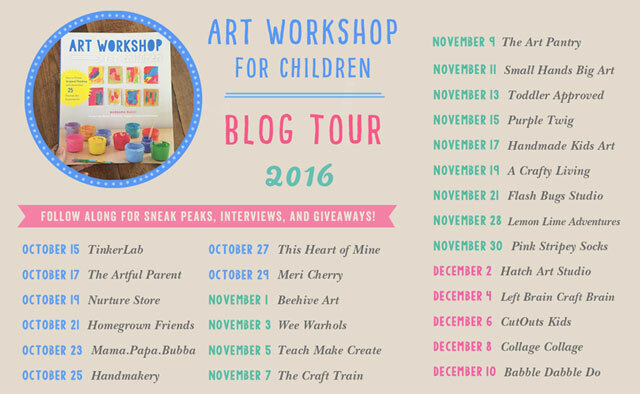 Be sure to check back in on the Art Workshop for Children Blog Tour 2016 to get sneak peaks, interviews, and giveaways! 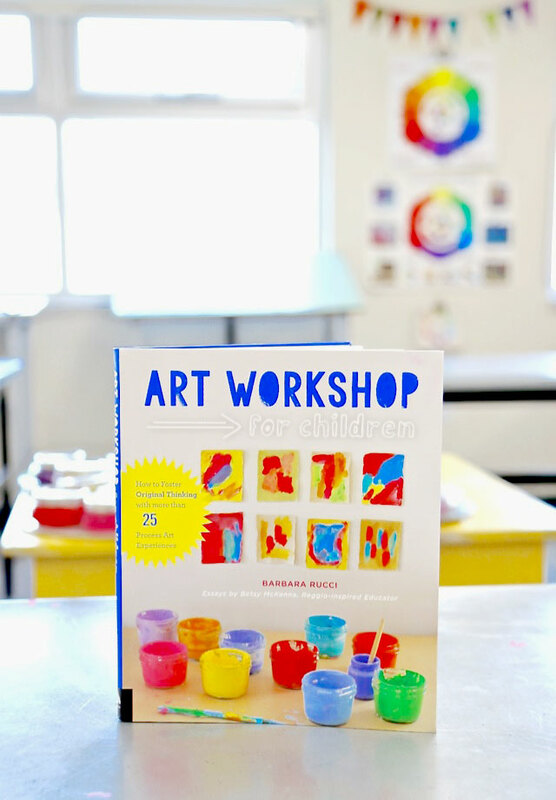 Thank you for following along and be sure to get your copy of Art Workshop for Children before they’re sold out on Amazon! Jump on over and say hello to us over on Instagram, would love to connect!